A virtual party in a glass, popping the cork on a bottle of sparkling wine is one of the happiest sounds on the planet. These effervescent beauties come in many different incarnations, with Champagne and Prosecco the most popular bottles in the market. Champagne is the ultimate in luxury, and typically the most expensive, whereas Prosecco’s fresh charms are a great value in sparkling wines. This pair of elegant wines represent some of the best sparklers available, and excellent values, bottles that you can afford to pop the cork often. Production methods and grape varietals give each its own distinct personality. Champagne, made from Chardonnay, Pinot Noir, and Pinot Meunier grapes, is produced in the same bottle that it is sold, and has rich, complex aromas and flavors of apple, pear, and lemon, mingled with toasty notes of biscuit or brioche, a result of lengthy bottle aging in cellars. When poured, it has a persistent bubble stream, with small, delicate bubbles pumping up the center of the glass, a sign of a quality wine. Prosecco is made mostly from the Glera grape, at least 85% of the blend, with other approved grapes rounding out the mix. Redolent of apple and pear, fragrant with white flowers and notes of citrus, it’s delightful effervescence tickles the nose and palate. Prosecco’s fizz is produced by secondary fermentation in large steel tanks, known as the Charmat method, that keeps the wine under pressure until it is ready to be bottled, preserving the fresh fruity character of the Glera grape. ​Champagne Charles Heidsieck is a negociant house, they buy grapes from growers, which frees them to focus on production and extended aging of their Champagnes. Over 150 years ago, Charles-Camille Heidsieck founded his Champagne house, and bought 47 chalk cellars, known as crayères, in the Reims area of Champagne, dating back to the 11th Century. Today, it is here, in these cool and damp underground tunnels, that Charles Heidsieck Champagne develops its aromas, texture, and complex structure. Touted as the “Charles style”, the importance of age is considered the “fourth grape variety”, with the wines resting on their lees for at least 6 years, way beyond the normal 15 months for most Brut Champagnes. The Charles Heidsieck Brut Reserve Champagne is elegant and complex, reflecting their 60/40/10 winemaking philosophy. The grapes from sixty crus, or vineyards, are vinified separately in stainless steel vats, and a base wine is made, from equal percentages of Chardonnay, Pinot Noir, and Pinot Meunier; then this wine is blended with 40% reserve Chardonnay and Pinot Noir wines, of which the average age is 10 years. This painstaking process assures a refined, complex, and voluptuous wine, which is their flagship bottle, comprising 90% of their production. The Brut Resérve channels the three most important crus. Chardonnay, from Oger in the Côtes des Blancs, makes it fleshy, Pinot Noir, from Ambonnay in the Montagne de Reims, adds fruit and structure, while Pinot Meunier, from Verneuil in the Marne Valley, gives it balance and texture. The Brut Resérve’s quality is evident. Extremely small bubbles, in a seemingly never-ending stream, rise through the golden wine, releasing aromas of brioche, hazelnut, and mango, apricot, and plum fruit. Lively and sensuous, this wine is enchanting, tickling the nose and taste buds with its pastry notes, plum and cherry fruit, and hint of praline. Delightful as an aperitif, this champagne is an excellent dinner companion, a perfect pairing with many foods, but especially seafood, poultry, Asian dishes, cheese, fruit, and desserts. 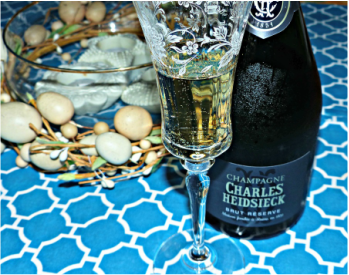 Charles Heidsieck Champagne over delivers in quality for the price point (SRP $65), with its Brut Reserve comparable to a vintage Champagne. Fresh, fruity, bubbly, and affordable, Prosecco’s popularity has skyrocketed in recent years. Quality Prosecco falls under the DOC and DOCG labels, produced from vineyards in a defined area, according to certain rules, with DOCG having the strictest regulations, sealed with an official label that guarantees its quality. The Italian sparkling wine producer, Bisol, specializes in quality Prosecco. Here, in the heart of Valdobbiadene, the best Prosecco producing area of the region, Bisol family traditions and innovation, steeped in history over 500 years old, yield an impressive lineup of sparkling wines. Under the Bisol label, six Prosecco DOCG Cru wines (single vineyard) and six Millesimati Talento classic method sparklers (vintage wines without Glera) are offered. The Bisol family is hands-on for the entire sparkling wine process. Involved in all stages of winemaking, grape growing, still wine and sparkling wine production, they work to maximize quality from the ground up, fulfilling the family’s motto, “Excellence from the ground to the bottle”. The Bisol “Crede” Valdobbiadene Prosecco Superiore DOCG (SRP $25), a blend of Glera, Pinot Bianco, and Verdiso, is one of their single vineyard Cru bottlings. Named for the clay and marine sandstone soils of the vineyard, the Crede is a bright straw yellow color, with small persistent bubbles in the glass. Fruity and floral with aromas of green apples, pears, citrus, and wildflowers, it has medium acidity and a slighter richer body, with a fresh effervescent nose. Smooth on the palate, enriched by an additional .5% alcohol, the apple and pear notes shine. This is an elegant prosecco that can be enjoyed from aperitif through the end of a meal. Excellent with pasta primavera, risotto, fried fish, and sushi, the Bisol Crede is a perfect dinner companion. Remember, Prosecco is best when consumed within the year after the vintage on the bottle, expressing its fresh and fruity fragrance, where Champagne is better when aged, displaying the toasty notes of secondary fermentation.